The story of the Tower of London is intrinsically tied to the story of England, since the building was built just after the Norman Conquest of 1066, the fortress has stood as a symbol of royal power, tradition, heritage and military might. Whilst many people may be familiar with stories related to those murdered or executed within its walls including the ‘Princes in the Tower’, Henry VI, Anne Boleyn and Lady Jane Grey. These are just a small number of stories related to the incredible history of this remarkable site. There is evidence of Roman buildings on the site before building work began on the fortress after the Norman Conquest of 1066, however it was the concerns of William the Conqueror and his less than enthusiastic welcome from Londoners that led to the construction of the Tower. When it was completed it was one of the largest castle keeps in Europe and dominated the surrounding area, it was a clear statement of intention that the Normans were here to stay. William the Conqueror’s successors made full use of the Tower as a Palace and a Fortress over subsequent centuries, however one of many colourful characters described in the book from this period was Geoffrey de Mandeville who was a constable of the Tower. Geoffrey de Mandeville became infamous for quickly changing sides in times of war if there was a profit to be made. He acquired a great amount of wealth but developed a less than honest reputation. King John in the thirteenth century was particularly fond of the Tower and stayed there for long periods, part of its appeal may have been King John feared for his life after making a large number of enemies. It was King John who established the Tower Menagerie and collected a large number of exotic animals that were caged within the Tower’s walls. The section on the Menagerie in the book is full of wonderful stories of this curious collection of animals. Over the centuries, the citizens of London became used to a number of strange and unusual sights including a polar bear from the Menagerie who was allowed to fish in the Thames in 1252 and the first elephant in London in 1255. Many of the animals in the menagerie had a short and unhappy existence, James I was particularly sadistic, pitting animals against each other in fights to the death. The book also relates that it was not only animals that suffered, visitors were occasionally maimed or killed by animals in the collection. Away from all the cruelty, people were given the opportunity of seeing wild animals in the flesh which inspired artists in particular. William Blake wrote and illustrated his famous poem The Tyger after seeing a real tiger in the Menagerie and Edwin Landseer was a regular visitor sketching the lions before making his sculptures for Trafalgar Square. If the Tower was a place of cruelty to animals, from its earliest existence it also gained a reputation for terror, torture and murder to humans. In 1278 Edward I had 600 Jews rounded up and thrown in the dungeons under the dubious claim of debasing the currency, many were hanged whilst others were released only after ransoms were paid. In 1380 the tables were turned on the elites when peasants supporting the cause of Wat Tyler stormed the castle and murdered the Archbishop of Canterbury. The reigns of Richard III and Henry VIII cemented the Tower’s grisly reputation for dark deeds with the ‘Princes in the Tower’ murders and the executions of Anne Boleyn and Catherine Howard. The long list of prisoners held in the Tower including many of the most important and influential people in English history including a surprising number of Kings and Queens. It is worth noting that all these dark deeds are not in the distant past. In the First World War, eleven spies were executed within the Tower and in 1941, German spy Josef Jakobs achieved an unwanted notoriety by became the last person to be executed at the Tower. The Tower as a prison is only one of the functions it has undertaken over the centuries, as well as being a fortress and a royal residence, it has been a weapons factory, royal mint and a secure repository for the Crown Jewels. However, it was not that secure when famously Colonel Thomas Blood stole and damaged the Crown Jewels in 1671, interestingly rather than suffering the usual grisly fate of other criminals, he became a celebrity and was given land and a pension by the King. 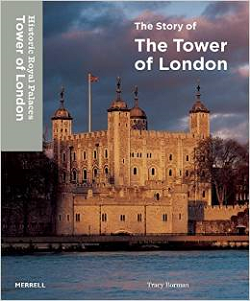 This lavishly illustrated and wonderfully entertaining book presents the many and varied stories that make up the Tower’s extraordinary history from its Roman origins to the present day. Many of the stories may be familiar, however there are plenty of surprises as the book illustrates that the Tower’s history is far richer and complex than many people would realise. It also reminds us that the Tower of London is not just a monument of the past but remains a living institution with a rich ceremonial life, and still attracts millions of visitors from across the world each year. This book, specially commissioned by the Tower of London and published in association with Historic Royal Palaces is wonderful resource for anyone interested in one of the most enigmatic and popular historic monuments in the world. By londonvisitors2014 in London Book Review - Non Fiction on June 24, 2015 .